Add a contemporary touch to any room in your home with the Brightech Mason, an LED hanging floor lamp. It features a metal arched support pole that gently curves to create a "hanging" effect. The circular burlap shade carries on the modern minimalistic style and makes it a great edition to any décor scheme. Forget about overly complicated lamps that just become a hassle to use. The Mason comes on with just a simple press of the foot switch, or can be controlled by a wall switch. The included Brightech Lightpro LED light bulb shines with just 9.5 watts and provides a soft ambient glow but can be swapped out for any bulb with an E26 base that doesn't exceed the 60 watt maximum. 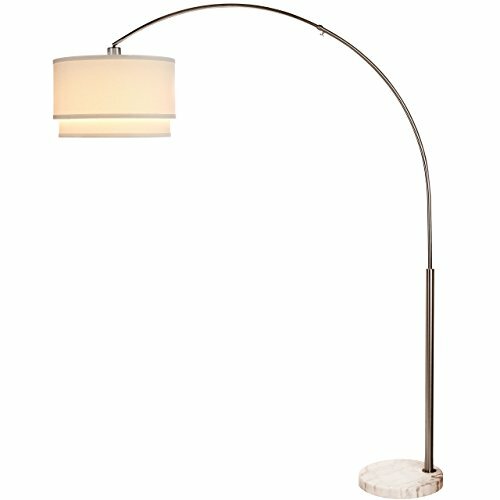 GORGEOUS CYLINDRICAL LAMP SHADE & MARBLE BASE: The Mason Floor Lamp's unique double cylindrical lamp shade measures 19 inches in diameter and 22 inches in height. It sits beautifully atop a stainless steel pole with a weight, marble base. The lampshade opens up at the top and bottom which diffuses the light and gives any room sufficient lighting with a calm, ambient glow. The neutral tones of this lampshade allow it to easily match and coordinate with any décor. LONG LASTING & ENERGY SAVING INDOOR LAMP: This Lamp includes a 9.5 Watt power saving LED light so that you will never have to replace a bulb. It's advanced 3,000K warm white LED technology with 800 lumens allows this lamp to outshine lamps that depend on short lived, energy consuming standard halogen or incandescent bulbs. This LED lighting will endure for more than 20 years without burning out or overheating. Save money and energy with the Mason LED Floor Lamp. Max Wattage 60 W CFL.